Let’s improve our body awareness, fitness, and co-ordination so that we can connect to our horse’s movement for more enjoyment while riding. Karen’s Rider Biomechanics Clinics focus on how to develop awareness in our riding so that we can efficiently and gracefully connect to our horses’ movement. The format progresses through a series of exercises that help the rider first with body awareness and then with other exercises designed to develop strength, endurance and coordination. What is the format for the rider biomechanics clinics? The clinics are designed for lots of exploration, awareness, mindfulness, and FUN!!!!!!! Human biomechanics is the study of how the anatomy (the muscles and bones) of the human body is put together and the mechanics (the nuts and bolts) of how the human anatomy works together to create movement. Rider biomechanics focuses on how the rider’s anatomy functions and how it work’s to connect to the horses’ movement. How connected the rider is to the horse’s movement is dependent on riding style. There are two common riding styles; one is to ride from strength and the other is ride from balance. When trying to ride from strength by gripping with the legs or holding on with to the reins, the rider becomes stiff and is not able to connect to the horses’ movement. A stiff rider hinders the horse’s natural movement. To connect to the horse’s movement, a rider needs to develop a balanced and supple seat. When riding in balance, the rider is able to move his arms and legs independently and is able to relax and connect to the horse’s movement. The understanding of basic human anatomy and biomechanics helps the rider to develop a balanced seat. As a rider becomes more aware of their own body, they can work towards controlling their body to effectively connect to their horse’s movement. Balanced riding has much in common with walking. Learning to ride follows many of the same steps and in the same sequence as a baby learning to walk. Walking is basically balance in movement. When one finds balance, the “sweet spot”, one is able to walk freely and efficiently. 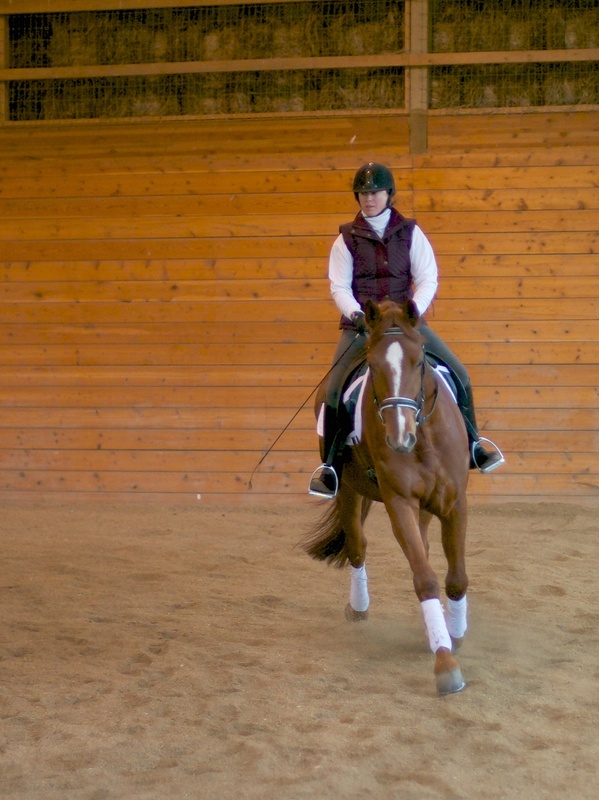 Riding, also, is all about finding this “sweet spot” while the horse is in movement. Leaves – fine motor development. The human body learns balance through movement. Children learn to run before they can stand. Gradually movement is refined, becomes more efficient, and fluid. The balanced rider utilizes the same sequence of steps and refines their riding until the rider’s posture is easily balanced and the aids become almost invisible. To be able to move in connection to the horses’ movement, the rider needs to have a supple seat and relaxed limbs. This requires that the rider rides from balance and that balance is dependent on a grounded and strong core. Grounding one’s trunk can be thought of as the feeling of having a bowling ball settled in their pelvis. Riders need to be able to stabilize their trunk (their core) by strengthening their abdominal and back muscles and to be in alignment with their ears over the shoulders and the shoulders over the hips and the hips over the heels. Another goal for the rider is be able to move the arms and legs independently of the trunk and of each other. To have independent movement in the limbs requires a stable trunk. They need to be able to control their limbs before they develop fine motor control. The independence of the arms and legs and the development of fine motor are required for timely and appropriate aids. Each of the three phases, trunk stabilization, limb coordination, and fine motor control (the use of hands and legs for aids and timing) include other criteria helpful in successfully developing the balanced seat. There are many teaching methods but most methods fall into two main categories; the command–oriented method and the experience-orientated method. This type of instruction is great when working with beginners and in when safety issues arise. Experience-orientated method (task based) teaching methods place the emphasis on what the rider is experiencing rather on what the instructor is commanding. Imagery – baby birds in the hands when holding the reins. In task-based exercises, the student’s attention is focused internally instead of outside the body with the instructor. Specific skills are divided into smaller elements so that the student can specifically work on the dynamic sequence of the motion. Quiet time is provided for the rider to experience and feel the movement required at the time. The instructor asks the student how it feels and how it might feel better. The experience-orientated method is believed to result in riders developing a feel for the horse’s motion and the goal is for the student to be able to work independently with the horse at home without always having an instructor present. Most of the exercises in Karen’s clinics are based in experience-orientated or task based methods. Hear it to understand it. Feel it to fix it. Karen uses all 3 types of learning in her clinics. Everyone hears that practice makes perfect and is a key to success. Researchers are finding that certain types of practice are more beneficial than other practices. Certain types of practice can increase skill up to ten times faster than conventional practice. It is about finding the “sweet spot”, the flow, or the being in the zone. There is an optimal gap between what you know and what you are trying to do. When you find the “sweet spot” learning takes off. Good practice is most beneficial when you remain in the “sweet spot”. This develops the needed muscle memory. Deep learning comes through concentration, by going inward, and by learning from mistakes. Capture failure and turn it into skill. Mistakes are appreciated and utilized to further develop the feel that the rider is looking for. The rider is encouraged to have self-compassion and to do all of the exercises with an ‘inside smile’. This creates an effective positive mental atmosphere that sports psychologists report as necessary for effective learning. Through these methods of learning, task-based exercises and “deep practice”, the rider is able to discover her own balanced seat through experimentation and it becomes easy for her to make subtle adjustments as needed. The rider’s internal source is developed for feeling when the body is out of balance or off of center. She feels when she is balanced and centered over the horse without mental and physical tension. Karen is excited to travel to your facility or club to demonstrate and lead riders individually or as groups in some really fun and challenging exercises. Past clinic and workshop participants had so much fun and really felt that they benefited from the workout experiences. Many of the participants have kept in touch and have commented on how their riding has improved. Let’s get aware of our bodies and connect to our horse’s movement so that we can have even more enjoyment riding our horses.